A different take on the standard leave-behind. Coming into a New Year is exciting. New challenges, new opportunities, and new perspectives… all very invigorating. From my standpoint, it gives me the opportunity to assess the marketing efforts we’ve pushed in the past year, and look to new ideas for more effective methods in the year to come. One effort we initiated last year was a portfolio book, and is one we will definitely continue in 2009 (revising and adding new projects as we see fit). It all started with a brainstorm session to come up with an effective tool to show off our product and capabilities, as well as act as a leave behind that potential clients could keep for future reference. When it comes to accomplishing these goals, most would immediately think: a brochure! Or even a portfolio, with the industry we’re in. 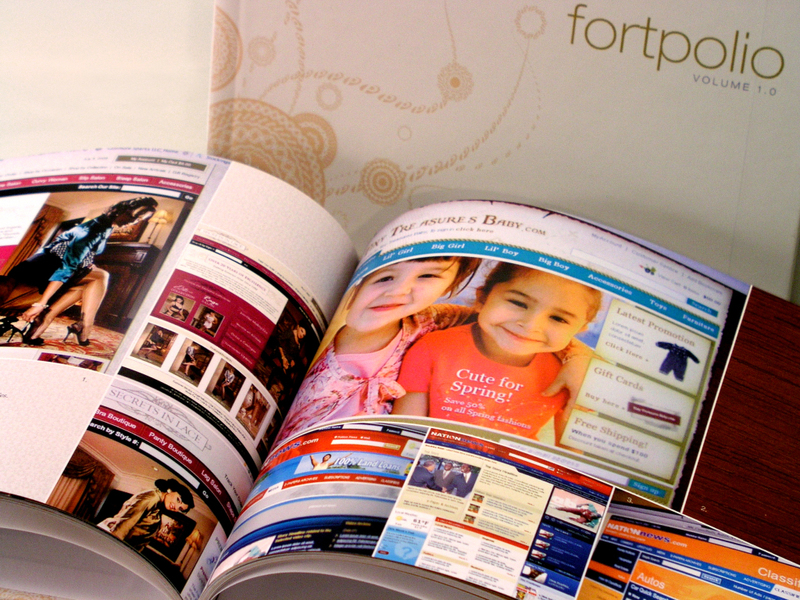 A brochure is definitely more cost effective than a portfolio, yet its so “salesy,” not to mention the fact that they usually end up in the trash (which is the last destination we want for our print materials – even if there is the potential of them being recycled). So, we thought long and hard about it and said, “Hey! What about a coffee table book? !” A uniquely designed book that would be artistic and interesting enough to keep out for others to see, while at the same time displaying Paragon’s talents. We immediately hopped to it, researched an online print company that would produce multiple copies at a reasonable price, and got to work with the design and copy writing. After weeks and weeks of revising and tweaking, we finally had our coffee-table-portfolio-book entitled “Fortpolio” (a misnomer in a brain draining session we just couldn’t shake). We sent the files off to blurb, and weeks later, VOILA! Our Fortpolio is here. First off, let me just say that not only is it cool to have published our own book (well, sort of), but the Fortpolio accomplishes every single one of the tasks we were trying to achieve. It displays our work and past clients, explains the company and what we do (in an entertaining way), not to mention, offers a little insight to some design techniques. What’s most gratifying is that the potential clients we hand these books to are not likely to toss them in the garbage like they would a brochure. Not to mention the major face time it will get sitting on their office desks and coffee tables. We’ve gotten great feedback from those who’ve seen it’s thus far (autographed copies have even been requested), and we hope they continue to make the impression we intended for them to make. As you plan and execute your marketing efforts this year, take the time to think about not just it’s “wow” factor, and where/how it will be received but also the life span of the material. What’s most likely to happen to the piece once the target’s finished reading it? Can they use it again? Will they have to (or want to) throw it away? Not that postcards or brochures are necessarily bad, just ask if they’re necessary. Besides, sometimes imposing these kinds of limitations on yourself yields more creative results. I’m interested in hearing what you think about this one. What qualities do you think a marketing tool/sales tool should have so that it grabs the attention of your prospectives and sticks in their minds longer than a 30 sec commercial? Not only can the man stare down CSS code until it writes itself in sheer terror, but he is famous around 220 E. Hall St for what we like to call his “happy dance”. Few have seen it, and those who have can’t get enough.